GAINESVILLE, Fla. – In just his third collegiate meet, Clemson freshman Roje Stona has already set the Tigers’ freshman record in the discus throw – on two occasions – and now ranks second all-time in Clemson history. Stona claimed his second career victory on Saturday at the Florida Relays, where he threw for 61.22m (200-10) in discus (Invite) at the Gators’ Percy Beard Track. Additionally, Stona’s mark is good for No. 3 on the NCAA Division I performance list, while he remains the top discus thrower in the ACC. Stona had previously set the program’s freshman record in his career opening meet – Georgia Tech’s Yellow Jacket Invitational – on March 16. In addition to Stona, Clemson saw even more personal bests from the throws group, including three top-10 program marks in the men’s and women’s shot put from Grant Voeks, Janell Fullerton and Veronica Fraley. The Tigers also found success in a number of relays including both the men’s and women’s 4x400m and the men’s 4x100m, all three of which the Tigers earned season bests. Grant Voeks cleared 18 meters – 18.07m/59-3.5 – for the first time in his career to place second in Saturday’s shot put (Invite). The junior moved from No. 5 to No. 4 all-time in program history. 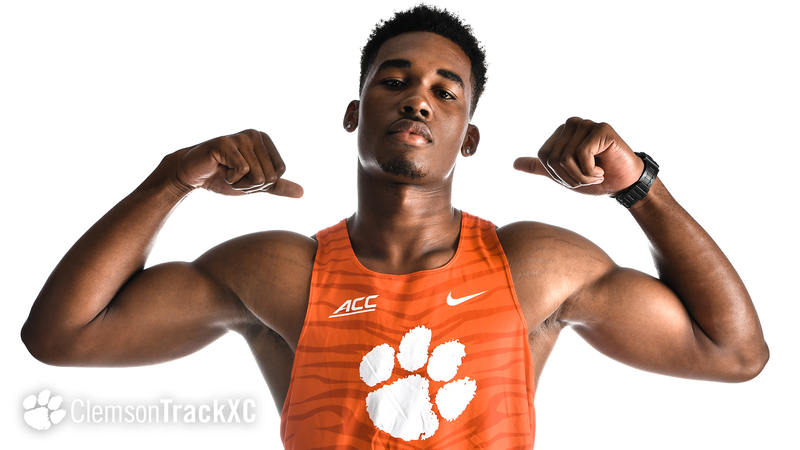 The Clemson men’s 4x100m relay consisting of Alex Sands, Marcus Parker, Fabian Hewitt and Deonte Tolbert ran their season best in the event, 39.59. The group placed fourth among all collegiate relay teams. In a race that came down to the very end, the Tigers shaved seven seconds off their season best as Deonte Tolbert, Fabian Hewitt, John Lewis and Marcus Parker collectively clocked 3:05.63. Parker anchored and nearly came away the win, an outcome that was decided by just 0.05 seconds. Janell Fullerton elevated from No. 8 to No. 5 for her performance in the women’s shot put (Invite). Fullerton achieved a best heave of 14.82m (48-7.50). She placed 14th among a competitive field in the Invite section. Freshman Veronica Fraley continued to make history after setting the program’s No. 2 record and freshman record in the shot put on Friday. Fraley reached a distance of 14.75m (48-4.75) on her first attempt of the day. On the very last event of the day, Kendra Clarke, Ebony Williams, Aliyah Mallard and Kamryn McIntosh achieved a team-leading season best time of 3:32.67 in the 4x400m relay, giving Clemson a 13-second boost from its previous 2019 outdoor best entering the weekend. The women’s 4x100m relay consisting of Sarah Hill, Rebekah Smith, Ebony Williams and Aliyah Mallard nearly matched their season best. The group clocked 44.55, just two-tenths of a second shy of their season best (44.32). Clemson heads to College Station, Texas for the Aggies’ ‘The Reveille’, which is slated for Saturday, April 6.